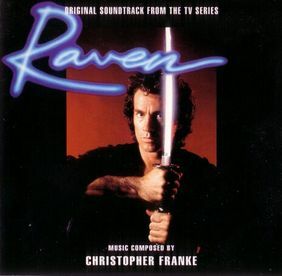 Raven was a weekly Hawaii based US TV series from with music by Chris Franke. After having been announced for several times, a soundtrack CD was released in 1994 in Germany by Sonic Images. The CD was produced in cooperation with the German Pro7 TV channel which aired the series. More information about this series is available at The Internet Movie Database. Five of the 16 tracks are recorded with vocals, that is: Don't Walk Away, Change My Skin, See The Light, Wisdom Of Love, and Ski And The Big Kahuna. Two of the instrumental tracks feature musical themes already known from the album Klemania. The regular CD comes with a black body; the promo release are pink with an additional printing "promotion disc" in blue colour on the CD body and the letter "P" behind the reference number. By mistake, some copies of the first German regular series were made in pink colour instead of black, but without promotional statements. There is a French re-release with the track Wisdom Of Love, sung by actor Jeff Meek. On this CD, track two and eight are exchanged, compared to the other releases. Raven was promoted by a video clip of Wisdom Of Love (3:32) for TV with pictures from the movie and a singing actor Jeff Meek. Another video, Don't Walk Away (4:03) was produced for in-store promotion; it shows movie sequences and nature pictures from Hawaii.